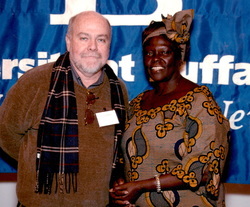 In 1997 Wangari Maathai established the Green Belt movement in Africa as a program of the National Council of Women of Kenya. The mission of this grassroots non-governmental organization based in Nairobi was to focus on environmental conservation, community development and capacity building. It was organized to plant trees, one of earths vanishing and most precious resources. Over 30,000 women have been trained in forestry, food processing, bee-keeping and other trades which help them to have an income and preserve lands and resources. Over 40 million trees have been planted. In 2006 Professor Mathaai won the Nobel Peace Prize for her work. 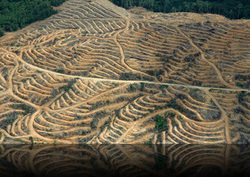 Palm Oil is the source of some of the earth's most catastrophic ecological and social disasters. The development of palm oil plantations in Africa, and Central and South America is responsible for massive deforestation of rain forests (and carbon emissions) , and for human rights abuses including the enslavement of children. Why- Palm Oil is valuable as one of the most widely used food additives. According to an article in Alternet written by Jill Richardson, Palm Oil is found in half of all packaged foods and in body care and cleaning products. It is identified on ingredient lists as palmitate, palmate, sodium laureth sulphate, sodium lauryl sulphate, glycerl stearate, or stearic acid. It even turns up in so-called "natural", "healthy", and "cruelty free" products like Earth Balance vegan margarine, Newman-O's Oreo cookies, and in "renewable biofuels.